We have given considerable coverage to the attempts made by Macy’s and Nordstrom to virtually pool their inventory. The idea is that while these firms need to carry inventory in a decentralized manner, in their brick and mortar stores as well as their main warehouses, they can still manage the inventory in a centralized manner. So, if an order is made online and the item is stocked out at the main warehouse, it can be sent to the customer from the nearby stores. The same idea applies when a customer places an order at a brick and mortar store that does not have a sufficient quantity. During our penultimate class in the operations management course, I was discussing the benefits of such inventory pooling, and illustrating them using our recent posts. One of the students, Ryan Orr (h/t) mentioned that he recently placed an order at the Macy’s stores in Oakbrook for 10 identical ties for an important event. The store had only a limited number of ties, and agreed to order the rest of the quantity from nearby stores, and ship them directly to Ryan. 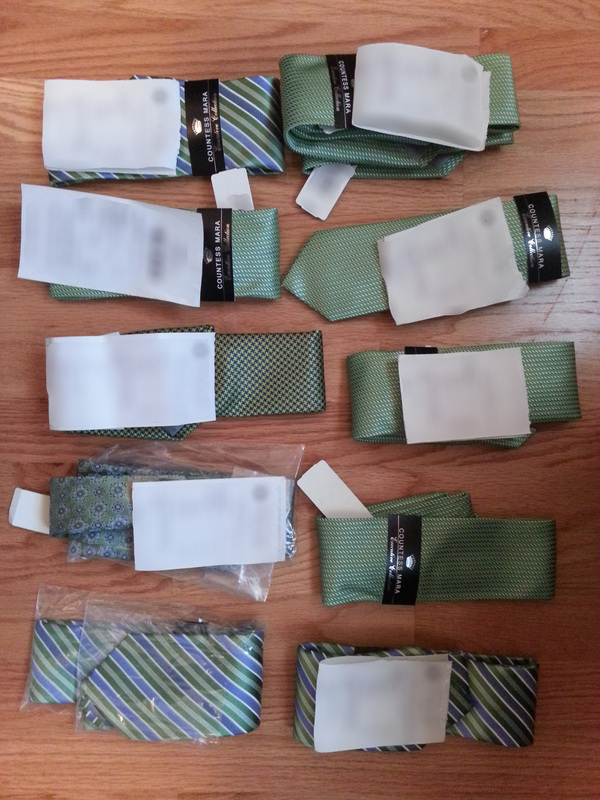 As you see in the photo, Ryan got 10 ties, with 4 different patterns from 6 different stores (all in the Midwest). We blurred the receipt’s, but confirmed that all ties had the same UPC code, which means that this was not a mistake of the store in Oakbrook, the employee or the stores that the delivered the product. They all thought that they deliver the product that Ryan wanted. (1) This is not a fast selling item (sorry Ryan), so over time the UPC number has transitioned from one pattern to another. Some stores carried the newer item, while other still carried the older one. (2) It is possible that some of these stores were not originally Macy’s stores. It is possible that some of these were Marshal Field’s stores, for example, and still carried UPCs that were based on their legacy systems. We could not confirm this explanation. If anyone at Macy’s is reading and has a better (and maybe the right) explanation, we will be happy to post it. The article discusses the broader appeal of these ideas, but focuses on applications to call centers. Why call centers? In contact centers, customer service agents, that are hourly workers handle a steady stream of calls under challenging conditions, yet their communication skills and learning capabilities play a crucial role in determining both the employee’s tenure and performance. The article discusses a new startup, Evolv, which helps firms find better-matched employees by using predictive analytics. Transcom, a global operator of customer-service call centers, conducted a pilot project in the second half of 2012, using Evolv’s data analysis technology. To look for a trait like honesty, candidates might be asked how comfortable they are working on a personal computer and whether they know simple keyboard shortcuts for a cut-and-paste task. If they answer yes, the applicants will later be asked to perform that task. When it comes to education, though, we must distinguish between learning and signaling. All debate and hype is about the learning but I have not heard anything about the latter, which I believe is at least as important (for better of worse). Just ask any parent (whose kid now just heard about college acceptance) about the strength of their desire to be admitted to certain institutions. We seldom hear the point that their kid will learn more at that desirable institution; so what is its attraction? Signaling (as Nobel laureate Spence wrote about quite a while ago). Admittedly, this distinction pertains mostly to top or “brand” schools, whose value proposition of the degree is signaling selectivity—that will not change by MOOCs or any online learning. The desire to signal uniqueness and distinction (and to self-classify as the BCC wrote about recently in their study and poll of “class” in the UK) is so human it is timeless. Add to that the desire to be surrounded by similar people or those one looks up to, and the opportunity to build lifelong relationships and networks, and to belong (to the club). Traditional US higher-ed is the best in the world to respond to these desires. First: what’s a keiretsu? A keiretsu is a cluster of interlinked Japanese firms, usually centered on a large corporation that holds equity in the smaller firms. Japanese auto makers have long seen keiretsu as a way to ensure quality over the long term by building trusted relationships with suppliers. The brand-name companies often own significant stakes in keiretsu parts makers and often enjoy the right of first refusal for newly developed technology. Typically, they work closely from the design stage onward, sharing proprietary technology. But there was a lot going on behind the scenes and some of it wasn’t legal. In fact, some areas of the Japanese auto-parts business were rife with bid rigging and collusion, according to confessions by companies and executives to antitrust officials around the globe that have produced multimillion-dollar fines and a dozen prison sentences.